Topics: Ac Test, Domestic, Consumer Units Installs & Upgrades, Fixed Wiring Testing, and Landlord Electrician Services. 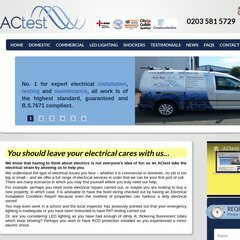 Actest.co.uk's server IP number is 83.223.106.10. Its 2 nameservers are ns2.n-e-t-working.co.uk, and ns1.n-e-t-working.co.uk.